We’ve seen it time and again over the last decade. An emergency strikes and panic grips the city or region for days or weeks on end. We saw a complete breakdown of emergency response and law & order during Hurricane Katrina. 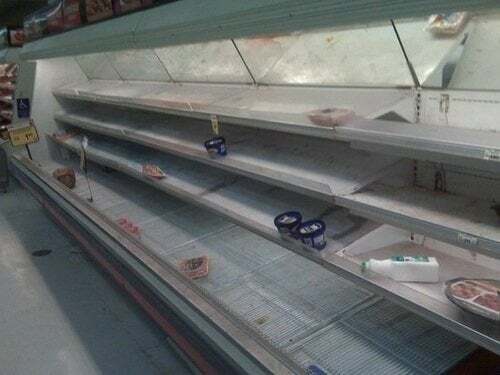 The 2011 Snowpocalypse on the east coast led to runs on grocery stores and empty shelves within a matter of hours. Widespread blackouts during Hurricane Ike left large sections of the Houston power grid down for up to four weeks. In all these cases gas was almost impossible to find, what was in your pantry was what you had until food distribution resumed, local water was not safe for consumption, and government response was limited to reinstating essential services first and foremost. The bottom line, as Jesselyn Radack of the Government Accountability Project notes, is that after billions have been spent by Department of Homeland Security, FEMA and local law enforcement, we are no more prepared today than we were the day before September 11, 2011. After a short but unusually severe thunderstorm that roared through the D.C. area on Friday night, the entire Washington Metropolitan Area was thrown into chaos. Three days later, countless traffic lights are still out, hundreds of thousands of residents are without power, including myself, grocery stores and gas station are closed for lack of power, and the federal government is encouraging employees to telework. Is this the work of a terrible terrorist attack? No, it is the complete disaster non-preparedness a decade after 9/11. Despite the fact that billions if not trillions have been spent since 9/11 on counter-terrorism and so-called “homeland security” measures, one of the major terrorist targets, the nation’s capital, cannot cope with a severe thunderstorm. I received a message from PEPCO that most D.C.-area residents may not have power until next Friday at 11:00 pm – a full week after the storm hit. With temperatures this week set for the mid to upper-90s, that is a long time for residents to be with air conditioning, or fans, or refrigerators. Two years ago, the Washington Post’s comprehensive examination of the billions of taxpayer dollars spent on “homeland security,” “Top Secret America” reflected that the D.C. metropolitan area was burgeoning with infrastructure, though apparently none of it focused on keeping the D.C.-area up and running after a severe thunderstorm. I am not the only D.C. taxpayer wondering, where are billions in “critical infrastructure” protection and “homeland security?” They are not going toward obvious solutions like putting power lines underground. The D.C. area’s responsiveness to unexpected events has not improved, but taxpayers’ pockets have been drained to create an entire secret city of “national security” in northern Virginia. Making sure citizens have food and power in an emergency should be a top priority, not a distant second to security theater like taking our shoes off before getting on an airplane. When Houston was hit almost head on by Hurricane Ike in 2008 the residents of the entire metropolitan area were shocked. Never mind the mass chaos as millions tried to flee the region, with drives to neighboring cities taking upwards of ten times longer than they normally would. Power for 90% of the city went out, and for some areas, including where we lived, power was not restored for almost a month. Suffice it to say our community was anxiety ridden, frustrated and tempers were flaring. When gas became wholly unavailable and the generators stopped running and we were overtaken with near 100 degree heat during the day, the situation for many became untenable. FEMA’s own web site calls on Americans to have a two week supply of emergency items, yet most citizens have only a three day supply of reserve food available – whatever’s in the kitchen when disaster strikes is what they’ve got until things get back to normal. Even after these recommendations from the very people who are tasked with responding to emergency and disaster situations, not a single resident in our community that we were aware of had emergency supplies on hand when Ike hit – even though many had gone through countless hurricanes before and knew what to expect. After Katrina, Ike, the various earthquakes, wildfires, snow storms, “Derechos,” power outages, and tens of billions in taxpayer funds supposedly appropriated into infrastructure, security and emergency response, it’s simply incredible that we are so unprepared as a society. Imagine, for a moment, what happens in a scenario that affects not a single city, but an entire multi-state region, or, perhaps the entire nation. And imagine that the event(s) is so widespread that government is totally overwhelmed – food transportation stops, refineries can’t get gas to local areas, water and power utility workers stay home to care for their families, law enforcement is faced with widespread looting, the internet becomes inaccessible as do all avenues of communication due to blackouts, and grocery store shelves remain out of stock for weeks or months. Such a scenario may be unlikely, but certainly possible – and the resulting effects on the population and our way of life would be nothing short of complete and utter pandemonium, especially for those who have failed to prepare.